76 in 1 Precision Screwdriver Set. 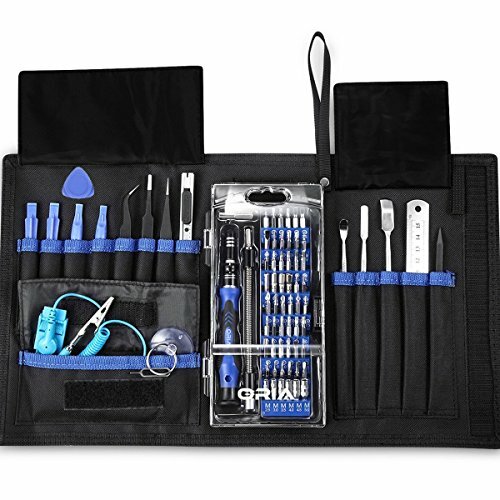 76 in 1 precision screwdriver set is a multi-function tool kit and is is designed to service all popular iPad, iPhone, PC, Watches, Glasses, Laptops, Phones, Game Consoles, and other electronics. The ultimate high-performance bit kit including all essential tools is great for every DIYer, fixer, hacker, hobbyist, and handyman. It's all-new and it's all-powerful. This is a set of tools you can trust, will not let you down. The kit is a great gift to give your friends, family and other people in Christmas, Thanksgiving Day, Birthday, Father Day etc. 4x Plastic Opening Tool. Made of soft plastic to avoid damaging your device. 3x ESD Tweezers. It can be used for handling small wires, screws, and reaching where your fingers can't do. 1x Utility Knife. Cut, Scrape and Clean. 1x Anti-Static Wrist Strap. Protect delicate circuits from harmful static electricity. 1x SIM Card Ejector Pin and LCD Suction Cup. 1x Spudger. Great for poking and prying tough-to-open enclosures, delicate components, opening ZIF connectors and so on. 3x Metal Spudger. For when plastic just doesn't cut it. 1x 6 Inch Metal Ruler. Makes measuring parts easy. 1x 58 in 1 Screwdriver Kit. Designed to include all you would need to repair small electronics. [Wide Application] Precision screwdriver set is designed to service all popular iPad, iPhone, PC, Watches, Glasses, Laptops, Phones, Game Consoles, and other electronics. If you have any questions about this product by ATPWONZ, contact us by completing and submitting the form below. If you are looking for a specif part number, please include it with your message. Maexus 80 in 1 Precision Screwdriver Set Magnetic Nut Drivers Kit, Professional Electronics Repair Tool Kit with Oxford Bag for Repair Cell Phone, iPhone, iPad, Watch, Tablet, PC, MacBook Etc.